Currently, there are some 220 more pairs of high speed trains in service daily between Guangzhou and Shenzhen from around 06:00 to 23:00, with an interval of no more than 30 minutes, and dense like city buses. Among them, G trains are running between Guangzhou South Station and Shenzhen North Station with the shortest travel time of about 30 minutes; some of them go further to Futian Station. The inter-city C trains go closer to city centers, and are in service between Guangzhou Station/ Guangzhou East Station and Shenzhen Station, with the shortest duration of about 80 minutes. Their ticket fares have no much big difference. The Guangzhou to Shenzhen distance by train is 102 km (63 mi) , 139 km (86 mi) and 147 km (91 mi) based on the different operation stations. Around 220 departures in total: departure time from 06:00 to 23:08; duration from 29M to 1H39M. Around 230 departures in total: departure time from 06:12 to 23:12; duration from 29M to 1H36M. Located at the city center, passengers in Yuexiu District can benefit a lot from this station. It has very convenient transportation to famous attraction sites such as Yuexiu Park, Ancestral Temple of the Chen Family as well as other railway stations and airport. 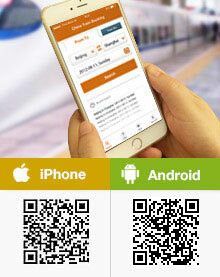 Starting here, one can also reach Canton Fair site easily by subway. The station is a time-saving choice for those located in eastern areas. And starting here, one can easily get to the Guangzhou Zoo. Besides, subway, city buses and taxis are all available here for passengers' convenience. As one of China's four largest rail hubs, the station operates more bullet trains to/from Shenzhen. Although located a little far from the city center, transportation here is convenient, including subway, city buses as well as coaches; and by them, passengers can go to other places quickly. The station is also connected with the Canton Fair site by subway lines. Located in Luohu District, this station is next to Luohu Port and has easy access to Hong Kong. Besides, there are subway, city buses and airport shuttle bus available for passengers' convenience. Located in Bao'an District, the station is a little far from the city center. However, subways, city buses and coaches within easy reach from the station make it convenient for passengers to go to other places and attraction sites. Passengers going to Beijing, Xiamen, Xi'an, or Zhengzhou can also take bullet trains here. As indicated by the name, this station is located in the Futian District, bringing great convenience for passengers in the southern part of the city. Both subway lines and city buses are available for easy transfers. There are over 7 pairs of them between Guangzhou Railway Station and Shenzhen West/East Railway Station. The duration is about 1.5 – 3.5 hours. The ticket fare is CNY230.5/114.5/225.5 for a soft sleeper and CNY77.5/158.5/161.5 for a hard sleeper. Booked via this website as they had good reviews and was not disappointed. Very easy and smooth communication with Monica. I was kept informed about the process every step of the way and got regular updates. Tickets were delivered to my hotel and everything worked out fine from there. Would recommend then and book with them again anytime. Well done and thank you for making this so easy! Something less to worry about when in China and not speaking the language. I found your service to be thorough. Your customer service and followup were greatly appreciated. I would recommend your company to anyone who's traveling in China. Great Service, Great communication, Great accuracy, Great trains. Absolutely perfect. I can use it very conveniently. It is excellent tools.. Fantastic train ride. Really enjoyed the speed and how smooth the ride was. The only problem I had was the difficulty in finding the place to collect my tickets. Since I don't speak mandarin.. I had a lot of difficulties in communicating to ask directions. I suggest you provide more detailed instruction / guidance to foreigners on where to collect the tickets. Ie have to go outside the building. We were very satisfied with the over all customer service. Personnel at the train stations were very helpful when we had a question about the ticket pick up. The procedure was clear and easy to follow. Thanks a lot for your support. We really enjoyed our journey. Thanks to Travelchinaguide.com our journey from Guangzhou to Shenzhen and back was very smooth. We booked through your portal and collected physical tickets at railway station on production of passport. Check-in was smooth, waiting room were clean and spacious. Boarding was seamless without any hitch. Trains on both direction were punctual and announcement were made in both Chinese and English languages. Definetey like your train booking service. Quick response also. Except the delivery of the tickets to another building even I've already put the new building at the delivery address. Overall your service was statisfy and very helpfull. I was satisfied with the booking experience with your consultant. Thank you very much for your excellent services. hope to get your services again in the future also. I think Guangzhou/Shenzhen is a good option right? Just for experience. It is no problem to get a return tickets on the same day I suppose. Yes! Since you are not hurry in time, it is no problem to buy it at station directly. You can buy what every available at the time. It is recommended to use a G train between Guangzhou South and Shenzhen North, 30 to 40min one way with top speed of 300km/h! Hi, I'll be arriving at Guangzhou at midnight. What is the best way for me to go to Guangzhou South Railway Station from Guangzhou Airport, so that I can take the early bullet train to Shenzen? How can I get there by bus, subway,or taxi? And how much it cost? If for midnight, there is no public bus or subway. You need directtaxi instead. Or you can take the airport shuttle bus route 7a to Yongcheng Hotel and then take taxi to the South Station. Sorry to hear about this bad news, but you may need to go to the station in person to see if they have it or not. They may ask you about the detailed place you lost it and how it looks like etc. There is no railway station in Baiyun airport. The closest one should be Guangzhou North Station, but only a few rides stop there. Most of them will stop at South Station istead. You can then take metro or taxi to reach the airport. May I know where's the best route to take ? Just for experience . Thank you . Is there any kids friendly places within walking distance from Shenzhen railway station ?